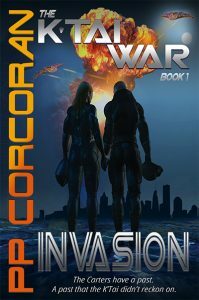 I am a huge fan of David Weber and Invasion was inspired by a scene in one of the Stars on Fire series books. In the scene the enemy have landed on a planet and aim to eat people, the marines are shipped in, but they don't have enough fire-power to stop the aliens. The marines decide to stay behind to save as many of the civilian population as they can before the navy returns in force to save the planet. I loved this premise and Invasion was the result. Dave and Sue Carter are the main protagonists along with their two teenage children. I imagined what would have happened had the characters from the film Mr. and Mrs Smith (starring Brad Pitt and Angelina Jolie) had kids and had great fun in deciding how the kids would have been brought up. Sue slipped her now empty magazine out, dropping it to the ground, and replaced it with a fresh one as an eerie silence fell upon the scene of devastation. Without a second glance at her victims, she took the few steps required to reach the track. It was a scene of utter carnage. What had been living, breathing human beings had suffered the same fate as the K’Tai that had died at Sue’s hand. Their uniforms, if that had been what they were, were torn to pieces. Where the armor worn by the K’Tai had gone some way to keeping their bodies intact, these humans had not had the benefit of armor. The mottled green and brown of the trees and bush was now awash with the bright red color of blood. Sue placed her feet carefully, trying her best to not step on anything that may have been human as she began the gruesome task of at least checking if any of the hapless victims had survived. Even if they had, there was nothing Sue could do for them, except maybe find a med pack with something strong enough in it to make their last few moments bearable. Of more importance at this point was supplies. Looking around, Sue judged that each of the bodies must have been carrying a pack, and where there was a pack there was every chance of finding food and water. The next few minutes were spent moving from body to body, checking each pocket and pack for anything which in any way might prove useful. One of the first things she did do was swap her K’Tai pulse rifle for a more fitting human weapon. Sue examined her new toy. An M89 caseless assault rifle and 100 round magazine with integrated high capacity charge. Slinging the rifle, she unclipped a thigh holster from one of the lifeless bodies. The holster contained a dull black P391 PIN pistol. Standard marine issue, the PIN had a completely self-enclosed cartridge that worked just as well in atmosphere as vacuum. Its ten-millimeter slugs were coated in specially hardened composite that made it a very effective armor piercer at close range while still carrying a hefty punch at ranges out to fifty meters. The fact that the weapons were standard marine issue and not militia caused Sue’s brow to furrow in puzzlement. Sue was not aware of any marine units being based on Agate, so where had these guys come from? No time to wonder about that just now, she needed to get the hell out of Dodge before anymore K’Tai came looking for their now deceased comrades. Hoisting a pack on to her shoulders into which she had stuffed water, food and spare ammo for her newly acquired M89 and PIN, she turned to head in the direction of the Yentoff Valley system when a cold, hard voice spoke to her from behind. With exaggerated slowness Sue did as she was told, silently cursing herself for being so preoccupied that she had missed her unseen opponent’s approach. Allowing her rifle to slip to the ground, she craned her neck to sneak a peek behind her and her eyes fell upon the biggest marine she thought she had ever seen, filling the whole of the narrow track and easily matching a K’Tai for size and build, the rifle in his huge hands looking like a toy. Toy or not, it was pointed steadily in her direction and the cold look in his eyes told Sue that he wouldn’t flinch to use it. “Hey, I’m on your side, marine,” Sue said with a throat that was drier than it should have been. The huge marine’s rifle didn’t waver a fraction from Sue as he scanned his fallen comrades, and Sue could see the muscles in his neck tightening. Sue nodded in the direction of the K’Tai ambushers. For a moment, the marine was startled by the sudden strength in the slightly framed woman, and his brain was still trying to compute her claim that she managed to kill a group of heavily armed enemy soldiers as, from around the bend in the track, came a line of a dozen marines, weapons at the ready. The first two marines skirted past Sue and took up post further along the track, while a third stopped beside the large marine who still had his weapon not now directly aimed at Sue, but in a position where it could be brought back into aim if required. You’ll be the lieutenant, thought Sue as she rapidly assessed him. Average height, broad shoulders, probably worked out a lot. A small smile creased Sue’s lips. These marines were all the same. They thought being able to lift heavy weights was the be-all and end-all. Her ears picked up the short, sharp whispered conversation with plenty of shoulder shrugging taking place, and Sue guessed that the officer was also second guessing her story. These boys will never learn. Another few disbelieving glances came in Sue’s direction before the officer cleared his throat and approached Sue. Sue cut him off with a voice that was cold as ice. “I killed them. Me. A little old school teacher, and I don’t care what you believe because I have family who need me and I need to move and I would suggest you do the same.” With that she bent down and retrieved the rifle, making to walk off, not caring that DeWitt’s muzzle was now aimed squarely at her back.